As cruise ships are not able to dock here you will be tendered ashore. (25 minutes) Zodiacs are often used. The tender pier is centrally located. 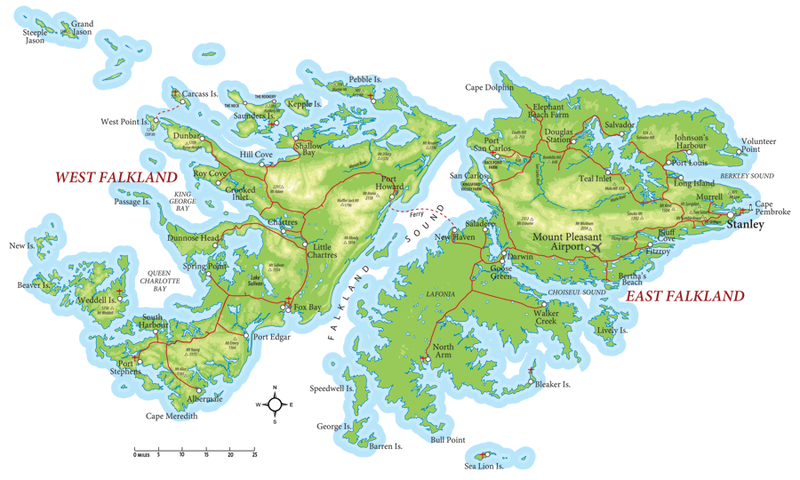 Stanley, formerly known as Port Stanley, is the capital of the Falkland Islands. This city was founded in 1843, and today is home to more than 1,500 people. The Falkland Islands Museum. Extensive information about the 1982 conflict, as well as history of the Falklands and some exhibits on Falkland Islands flora & fauna. Christ Church Cathedral. This cathedral is the southernmost cathedral in the world. The much-photographed arch in front of the cathedral is made from the jawbones of two blue whales. Stop at the tourist station at the pier for a town map and follow the Stanley harbor Maritime History Trail. Philatelic Bureau, Ross Road, Falkland Islands stamps and first-day covers are known throughout the world and can be purchased directly from the Philatelic Bureau. The Falklands pound equals one pound sterling and notes and coins are similar, except in design, to those of UK. British money circulates freely in the Islands. There are no automatic cash machines. Falklands currency cannot be exchanged for Sterling or other currencies outside the Islands.